Apple has updated its Knowledge Base Article #14449 describing the PowerBook and iBook Power Manager and and how to reset it. Resetting the power manager also resets the Date and Time. After the reset, the system clock on some iBooks and PowerBooks is set to 00:00, 1904-01-01 for computers with Mac OS 9 or 00:00 (GMT) and 1970-01-01 for computers with Mac OS X.
Resetting the PMU is not intended for resolution of a stall or situation in which the computer is non-responsive. A PMU reset should not be necessary except as a last resort in cases where a hardware failure of the power management system is suspected. Performing a PMU reset returns the iBook and PowerBook hardware, including NVRAM, to default settings and forces the computer to shut down. "Apple is shipping the new 15" (and 17") Aluminum PowerBooks with the Fujitsu MHT2080AT 80 GB 4200 rpm 2 MB cache drive as standard equipment. For an extra $125, you can get the optional Hitachi 5K80 80 GB 5400 rpm 8 MB cache drive. "Many of you are asking which drive is the best choice for your PowerBook. Some of you are like me. You want to go faster still. With the Hitachi 7K60 7200 rpm 60 GB 8 MB cache drive dropping as low as $235 in recent days, it's tempting to order the cheapest drive from Apple and replace it with the 7K60. "Others are thinking they want maximum capacity. Maybe the 80 GB 5K80 is fast enough. Maybe the stock 80 GB drive is sufficient, too." IOGear has launched its wireless Mini Mouse 800 RF, enabling mobile computer users to work more easily and accurately in space-restricted locations, such as airplanes, cars, and coffee shops. A recent survey conducted by IOGear revealed that 72% of laptop users said they would rather purchase a separate mouse than use a touchpad. The PC and Mac compatible wireless Mini Mouse makes it simple for mobile users to work from a computer or laptop without dangling wires. Mini Mouse RF comes equipped with a unique on/off switch to prolong battery life. In addition, there is a motion sensor that puts batteries on "idle" when there is no movement detected, also saving battery life. The compact ergonomic design and optical sensor offer comfortable use on most surfaces without the need for a mousepad. The symmetrical design makes it an ideal tool for left- and right-handed users. Ideal for users in need of precision computing, the device offers 800-dpi resolution, twice the accuracy of standard mice. The high resolution also requires less cursor movement, an advantage for travelers working in confined spaces. The product is priced at $49.95 (MSRP) and is available immediately from all major catalog resellers, online resellers, and selected retail outlets. "Situations often arise when you find yourself needing additional space to work, such as on a plane or in the car. The size and physical connections necessary with traditional mice make it difficult to work in these locations," said Miranda Su, vice president of sales and marketing at IOGear. "Mini Mouse RF allows mobile professionals to work in virtually any situation without wires getting in the way, making it the ultimate tool for today's road warrior." 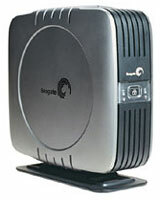 Mini Mouse 800 RF is compatible with Windows 98, 98SE, 2000, ME, and XP operating systems, as well as Mac OS X or later. The mouse is USB and Plug and Play ready. It also comes with a carrying case, USB battery charger cable, and USB extension cable. Harmonic Inversion Technology has announced that the new VTBook PC Card video card for PowerBooks is shipping. VTBook works with any Type II PC Card slot equipped PowerBook running Mac OS 9 or OS X and a VGA, DVI, or ADC monitor (with a DVI to ADC adapter). VTBook is a product of VillageTronic of Germany and imported by Harmonic Inversion Technology. The suggested retail price is $249. Additional display space is ideal for those PowerBook users who need an easily transportable notebook but also need to use a full-size monitor when sitting at a desk. Road warriors, programmers, creatives, and many other PowerBook users will find the additional display space provided by a second monitor invaluable in order to maximize productivity. VTBook supplies more than simple video mirroring - it is a complete second video card. Windows can be dragged from the PowerBook display to the external monitor seamlessly. PowerBook users can get as high as 1920 x 1200 resolution with VTBook's 32 MB of 266 MHz DDR memory. VTBook supports resolutions from 512 x 348 through 1920 x 1200 at millions of colors. Screen Doubler technology provides a virtual desktop that is double the size of the display itself - autoscrolling when the edge of the screen is reached. VTBook is hot swappable under OS 9 and supports both Deep Sleep and Hibernation. VTBook ships with a DVI connector as well as a VGA adapter. Mac OS X is supported with Quartz 2D acceleration. There are few competitive products. The Margi Display-To-Go PC Card (SRP $224) supports thousands of colors at 1600 x 1200 resolution with 4 MB of video memory. A less-capable 2 MB card is also available that produces millions of colors at a maximum resolution of 800 x 600 - but Mac OS X is not supported. There are three refresh rates 60, 75, and 85 Hz. This card requires a different dongle to attach to various types of monitors. VTBook and the other products of Harmonic Inversion Technology can be found at retailers such as Small Dog Electronics, Red Dye #3, TechnoWarehouse LLC and MacMall. Hughes Network Systems, Inc. has introduced the latest member of its family of DirecWay broadband terminals, the DW6000. The DW6000 is self-hosting, eliminating the requirement to install any special software on customers' computers and extending DirecWay service to Apple Macintosh PCs, beyond Windows-based systems. The DW6000 is available to subscribers of DirecWay residential services in the United States and will be offered through all DirecWay U.S. sales channels, including independent and national retailers, as well as online. Internationally, the DW6000 will be sold to enterprise customers by HNS' regional sales offices and also will be available from authorized value-added resellers and service providers. For more information, email globalsales@hns.com. The cost is US$60 per month for standard service, which allows for two simultaneous broadband connections. Business users that want a static IP address and dialup access for remote connections will pay $80 per month for HNS's Professional DirecWay option. However, monthly service charges are just part of the picture. HNS charges $600 for its DW6000 terminal. But for users in rural areas, DirecWay may be the only broadband service option. The original Stealth - a premium backpack for on-the-go digital photojournalists and sports photographers - is now sized to fit the PowerBook G4. Beneath the discreet exterior, there's room (and protection) for a notebook, digital camera system, overnight essentials, and a small virtual office. And with all the pockets on the backpack and the notebook case, it's easy to stay organized. You can adjust the removable, padded notebook case for left or right access - or use the case separately on its own shoulder strap. The Stealth AW II has an adjustable backpack harness; sternum strap and back pad with DryFlo mesh; and an all weather cover for protection from rain, snow and dust. The included cell phone pouch can be detached and fastened to a belt. Based on the successful original, BP3 is the third generation BooqPaq, with optimized laptop protection, now with an entirely separate zippered laptop compartment lined with non-scratch fabrics. While Booq implemented many customer requests and other powerful design improvements like more internal padding and interior pockets, they have created a lighter BooqPaq overall. 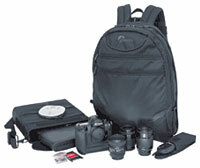 Designed to be the perfect technology center and versatile laptop backpack with tons of storage options for your laptop and gear, MPEG -player or CD player, media, digital camera, and documents, this laptop backpack leaves plenty of space for all the other stuff you'll need on your next trip. BP3 also makes for a great school backpack or college backpack with room for a stack of books 6" high. This backpack is comfortable to wear - even for long hikes at heavy loads - due to unusually wide shoulder straps, attention to ergonomics and human factors in design. 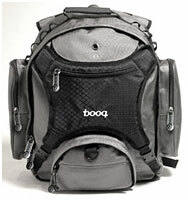 In fact, because Booq has paid special attention to female ergonomics, BP3 is an extremely comfortable women's backpack. external front pocket stores up to 10 CDs, disks, etc. While the actual laptop backpack is available in black, navy, and cool gray, the pack's detachable front piece "Shell" comes in a variety of styles, so that you can build your personal BooqPaq, and change styles whenever you want. Interior Dimensions: 14.25 x 12.0 x 2.0"
Exterior Dimensions: 16" x 14" x 6"
Jumsoft Keynote Themes 2.8 includes 15 high-quality themes for Apple's Keynote presentation software. New themes (Elegant Pro and PorTable) and old themes (Black, Geography, Grass, GridWay, RedWine, Black Table, Old Paper, Photo Artist, Network, Wood, Developer, Valentine, and Simple) are available in both (1024 x 768 and 800 x 600) sizes. "PorTable" theme is exclusively created for 15" PowerBook G4 screens, while Elegant Pro is a professional theme and comes with extras and many different layouts. A majority of themes includes custom bullets. Keynote Themes 2.8 fits all business, scientific, educational, informative, persuasive, and creative purposes - and now they are even portable. Keynote Themes 2.8 also includes a little application for controlling Keynote using a cell phone, Keynote Buddy 1.0 Beta. A downloadable (120 MB) version of Keynote Themes 2.8 is US$25. Version 2.8 is free for already registered customers. 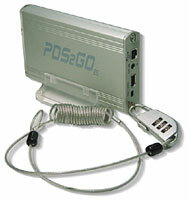 FireWire Depot has introduced the PDS2GO 2.5" enclosure. This enclosure features 1394a (FireWire) and USB2 capabilities utilizing the Oxford 911 chip for FireWire and the NEC controller for USB2. The new enclosure is all aluminum, except for the interchangeable front bezel and foot stand (for placing the enclosure in a vertical orientation instead of horizontal). Three interchangeable front bezels and foot stands are included (blue, clear and grape). Also included is a combination lock and cable for securing your drive at trade shows or other locations where someone could walk away with your valuable information. And, finally, a leather carry case is also included. FireWire Depot has introduced the Cutter 800, a new 1394b FireWire 800 USB2 combo 2.5" enclosure to its extensive line of 1394b products. The Cutter 800+ (1394a/USB2) provides cutting-edge technology with maximum durability, flexibility and portability. Extra slim design (9.5 mm hard drives only) and aluminum casing make for high performance at your desktop and on the go. The Seagate Spacer 160 GB external drive connects to your PC or Mac with USB or FireWire. Highly advanced, yet easy to use, this external drive features push button backup, a convenient on/off switch, and stunning good looks. It runs much cooler than other external drives. You can connect and disconnect your drive without turning off your computer. You can even stack your drives, thanks to the unique interlocking design. From video and photos to MP3s, today you have more digital files than ever. This wonderfully compact drive is the ideal way to store those files safely. With sophisticated features and software, it's amazingly easy to store movies and pictures of family and friends, the latest computer games, your favorite music, and all the treasures of your digital lifestyle. Altec Lansing Technologies, Inc. has announced the debut of inMotion, the first portable audio system designed expressly for the Apple iPod. Combining compact design, extra-low battery power consumption, powerful Class D amplification, patented MaxxBass technology, and a unique, built-in iPod dock, inMotion gives iPod owners enhanced audio performance. inMotion features four full-range, custom-designed neodymium micro drivers for clear audio output - but the sound surprises don't stop there. Using principles borrowed from the professional audio world, inMotion also delivers incredible, natural-sounding bass at frequencies far below those otherwise possible by small speaker sets. The result is a revolutionary step in portable audio - and a must-have accessory for every iPod user. "inMotion takes the iPod to a whole new level of excitement," said Bob Garthwaite, Senior Vice President, Sales & Marketing for Altec Lansing Technologies. "No bigger than a paperback book, inMotion turns the iPod into a platform for convenient, headphone-free listening anytime, anywhere. Its sound quality rivals systems many times its size. We're grateful to the team at Apple for working with us to create the perfect iPod companion." Sleek in design like the iPod itself, inMotion matches the iPod color scheme and offers a built-in docking bay located between the system's two speakers. When placed in inMotion's docking bay, the iPod can perform all the same data transfer and synchronization functions possible via Apple's standard, freestanding iPod dock. inMotion even takes advantage of iPod's alarm feature to create a fully functioning alarm clock that plays wake up music of the owner's choice - perfect for travel or dormitory use. Other convenient features of inMotion include a headphone jack for private listening; an auxiliary input jack for connection to other audio devices such as laptops, older iPods, and other MP3 players (3.5 mm stereo cable included); and built-in, flush-mounted power and volume controls. inMotion's Class D Amplification provides maximum sound with minimum power consumption. Smaller, cooler, and more efficient than other amplifier alternatives, inMotion's onboard amp can support up to 24 hours of continuous playback on just four AA batteries (not included). For desktop or other indoor use, inMotion also includes an AC power supply that recharges the iPod anytime it sits in the inMotion docking bay. Altec Lansing's inMotion portable audio system is priced at $149 and will be available exclusively at Apple's online store through the month of October, 2003. Beginning in November, inMotion will also be sold through Apple retail stores nationwide. Customer orders for inMotion will be accepted starting October 1, 2003. XtremeMac has announced that the Premium iPod Car Charger for Apple's newest generation of iPods is now shipping to dealers and customers worldwide. This new product joins the original XtremeMac Premium iPod Car Charger to provide the ultimate in mobile charging for all Apple iPods. The Premium iPod Car Charger is a study in graceful understatement with a focus on function. From the inception of the XtremeMac Premium iPod Car Charger for the first generation iPods, it has been the #1 choice of discerning iPod users worldwide, outpacing sales of all other brands. Popularly priced at $19.95, the Premium iPod Car Charger delivers the iPod user exactly what is required, in a beautiful package unhindered by superfluous features that add unneeded complexity and increased cost. Beautiful: Styled to precisely match the iPod. Simple: The Ultimate in plug-and-play simplicity. A single red LED illuminates to indicate that the Premium iPod Car Charger is plugged into a live power source. The iPod's internal charging circuitry manages the power to the battery and displays charging status on its screen. Safe: The Premium iPod Car Charger features a removable fuse for over current protection, as well as diode protection against backflow current. Durable: Features an impact resistant shell and integrated cable strain relief on both ends, as well as using the finest expandable coiled cable. Protected: Backed by a limited lifetime warranty. The new Premium iPod Car Charger is available alone for $19.95 or as part of the new value priced Get Connected Kit for $49.95. The Get Connected Kit contains six essential items to maximize the ways the iPod can be used. The Get Connected Kit saves customers over $40 on these items if purchased separately. PowerBook 3400c, 48/1.3/CD-ROM, $189.99. One year extended warranty $70 extra. PowerBook 3400c, 48/1.3/CD-ROM, $239.99. One year extended warranty $60 extra. Machines are refurbished and include a 30 day guarantee - or buy an extended 1 year warranty.